It's our pressie for (sort of) guessing the exciting news over at Wild Dingo's place!! Well look who's honing in on MY Salmon treatsies! It's a bald headed cocker mess! And look what else we got - Mom was all like - "This is perfect, now the house won't smell like stinky dogs on Christmas", Hey Mom it took me a whole week to get that just-bathed smell outta my coat! Thank you Juno & Loki!!! That was a FUN contest! We hope everyone is having a wonderful Christmas Eve! Despite it's appearance, the above breed is not a Cocker Spaniel but a Cocker Mess. You can tell by the evil look in it's eye and the extreme mischief it is always getting itself into. 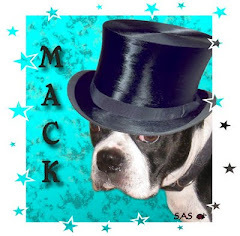 Mackapedia describes the Cocker Mess as "an ornery breed of dog; one that is constantly peeing on the floor and pooping on your doorstep just where you would normally walk. This breed is thought to be a descendant of the cat family." And mom is making me apologize for yesterday's post. Actually I told a small fib. Lilly didn't make that cake for me. It was a present from one of dad's co-workers. Sorry Lilly! That evil cocker is rubbing off on me! Anyhoo, wish us luck today, we have to go to the groomers. Waaaah! It was a Triple Chocolate Fudge cake with macadamias, raisins, onion and poinsettia leaves. WTM??? I hope Santa leaves her a big ol lump of coal. Do you see me smiling Lilly??? Okay, Now I Get It! Mom's surprise was it's my birthday today! hey dad that's my cake, okay? 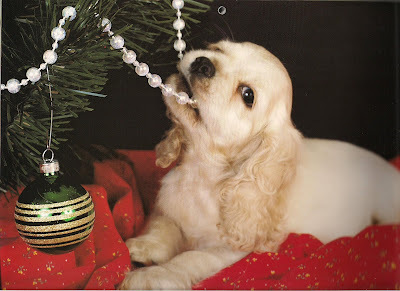 We each gave it two dewclaws up! Thanks to everyone for the birthday wishes!! You guys RoCk!! And Christmas is over a week away too. I am so confused as to what's going on. She said "tomorrow you will understand". Wow I don't know if I can wait that long. This one's for you ScooterMan! Wow - Santa doesn't ever bring us this much! The two cards are from our pals Mango (on the left) and Moco, Foley & Dawson on the right! Thanks guys! And thanks to The Brat Pack & Josie for playing Paw It Forward! Would you two ask your mom to email our mom at kullerd @ cmaaccess.com with your address? It'll be FUN! Have a great weekend everybody. And stay warm! It was our Paw-it-forward present from Oakley & Swisher! The box was FILLED with goodies for us!! Mom couldn't believe how much stuff we got! Lilly was all like "I just know mom is gonna put my pic in there!" Here's Paris with her Cockermess snout way down in the box! Paris claimed this as hers. We'll have to see about that! Am I as handsome as this guy on the card?? Here's a video of us going nuts over our goodies! THANK YOU so much Oakley & Swisher!!!! Now the rules of the game are the first three doggies (or kittehs, hammies, wheelies, etc.) that put in a comment saying you want to play will receive a p-i-f pressie from us!!! Fun, I know! So let us know if you wanna play!!! PS: We got so many pressie that mom's camera battery went dead on her and she couldn't get pics of all our great stuff. So stay tuned for Part II ! We dogs like it too! And I forgot to tell ya -we found out those smelly cats that were hanging around my front porch belong to the NEIGHBORS! Now if I could just get their feline cooties off my property!